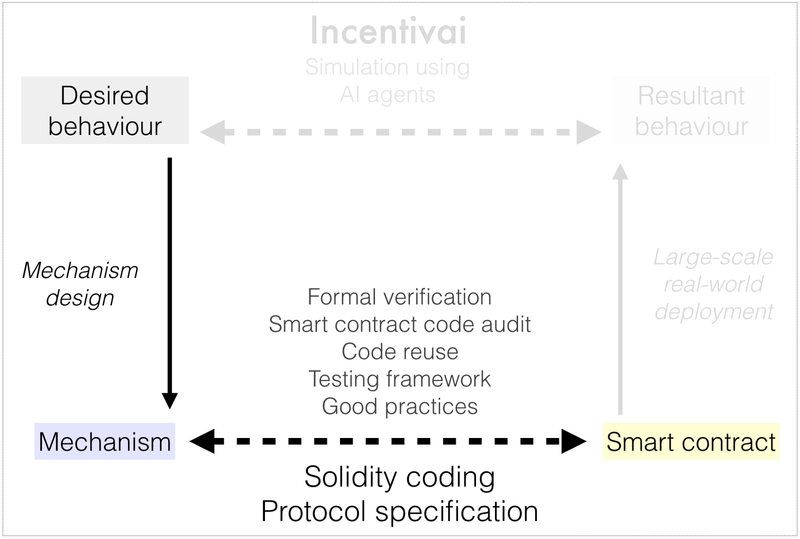 This post introduces the idea of “4 stages” which helps conceptualise the role Incentivai plays in the smart contract blockchain ecosystem. See the previous introductory blog post for a high-level overview of the project. For more details, see the concept paper. 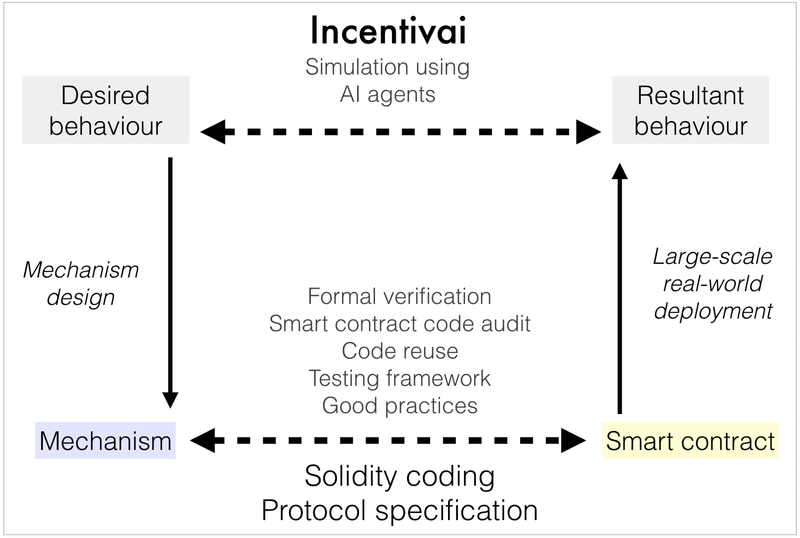 Economy-based smart contracts implement a mechanism which generates a set of incentives for users. The goal is to design it such that the resultant behaviour (once the contract is deployed and widely used) is as close as possible to the desired one. In what follows, I will go through the above diagram step by step (anti-clockwise) and highlight the role played by Incentivai. A simple smart contract such as ERC20 token or property record doesn’t have an economy element to it. All it does is implement some functionality. The only concern is to ensure that once encoded (e.g. in Solidity), the functionality is exactly as intended. 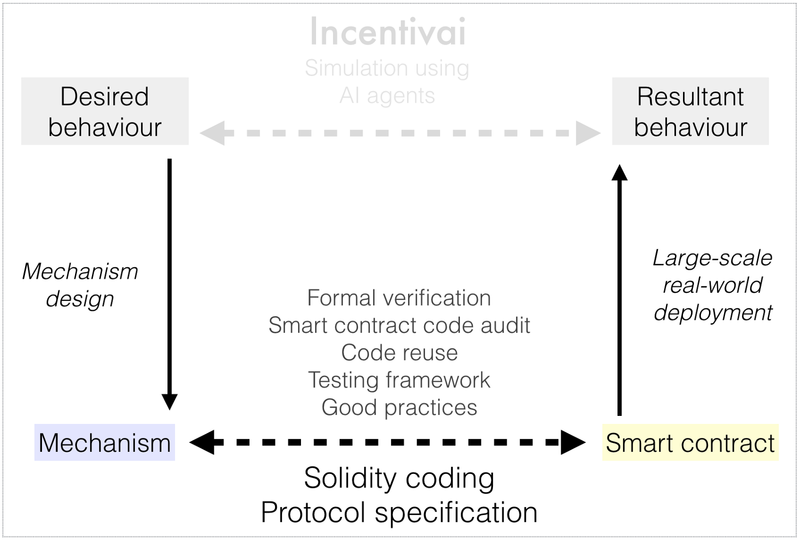 Popular techniques include formal verification or external smart contract code audits as well as traditional software good practices such as code reuse or testing frameworks. Some contracts go beyond basic functionality and aim at generating incentives for certain desired user behaviours. Examples include prediction markets, decentralised oracles, decentralised computing, decentralised storage, decentralised data exchange or content curation. Economy-based protocols such as proof of work or proof of stake are also relevant examples. What all of the above have in common is that a mechanism needs to be designed to incentivise the desired behaviour. 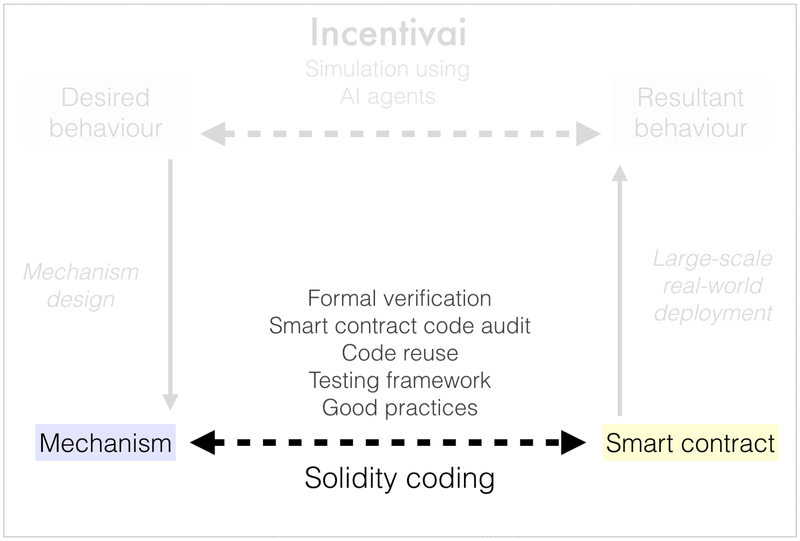 Smart contract mechanism design is about achieving the desired behaviour in the real world. For that to happen, not only does the code need to be bug-free but also the mechanism itself must be correct. Resultant behaviour is what happens when a large-enough number of users interact with the contract for long enough, with enough money at stake. With that in mind, while test net deployments and bug bounty programmes are extremely insightful, they might fail to reveal the whole picture. Incentivai proposes a solution for investigating and tackling misalignment of desired and resultant behaviours. Incentivai is a testing platform based on simulation using AI agents. It allows for investigating possible resultant behaviours and iterating on design safely, prior to smart contract deployment. See the concept paper or get in touch for more details. I would like to thank Trent McConaghy for reviewing this post.